I came across your site while looking for a source for the book "The Complete Jowett History". Thanks for that information. I notice that your genealogy omits the fact that Ben Jowett had two daughters, Marjorie and Constance, both of whom worked at the Idle plant in their time. Marjorie was my mother, so I and my sister are the grandchildren of Ben Jowett. Marjorie was the manager the canteen at the Jowett factory during the thirties: "It was very well appointed with a maple dance floor, subsidised meals at 9 pence for 2 courses...the company jazz band played at dances...". 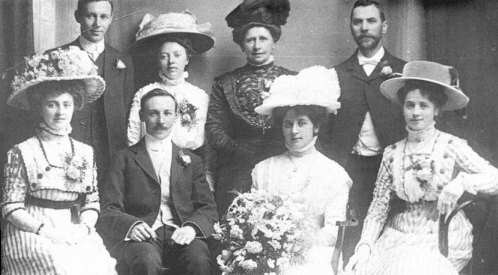 This family photograph was taken at William and Edith Jowett's wedding in 1909. L to R seated: Beatrice Jowett, William Jowett, Edith, Nellie (Edith's younger sister). One theory for origin of the name Jowett (and its variants) is that it derives from a Norman-French ancestor of name Jouet (or possibly Jouette). This is plausible because both names exist in France to this day. However - read on!! He states that there are two main schools of thought as to the origin of the surname. One is that it comes from Henri De Juatt, the Norman who lived in England during the 11th Century and is alleged to have been given lands in Bredbury in Cheshire by William the Conqueror (though Dave can find no record of this in the Domesday book). He was knighted and participated in the pilgrimage and assault on Jerusalem in the First Crusade, 1096-1099. The family then probably spread out to Derbyshire and, perhaps to Yorkshire where roots were firmly planted. Another source of the name (Dave's researches have shown) is as the derivation from a personal name - a diminutive of Juliana or (even Julian), variously found as Joetta, Jowet, Jouuet and Jowett which was used popularly in the 13th and 14th century especially in the Bradford (Yorkshire) area. By 1379 the descendants of a lady of this name were living in Clayton and Thornton, both near Bradford; Jowetts then spread to the neighbouring villages and towns of Manningham, Heaton, Shipley, Allerton, and Bowling. By 1641 there were 41 males over the age of 21 living in Bradford alone. In 1415 a William Jowet of Thornton was involved in a dispute over rights of pasture, according to the court rolls of the Bradford Manor. It may be that the Bradford branch are descendants from a fecund but unmarried Yorkshire peasant lass of this name! The Jowett Motor Manufacturing Compay was founded in 1901 by the brothers William and Benjamin Jowett and their sister Ruth, in the city of Bradford, Yorkshire, England. Wilfred Jowett, "Gas engine maker and General Engineer", had five children, Ruth, Benjamin, Joseph, William, and Beatrice. Joseph died in infancy, and their mother died when they were still children, so Ruth brought up the two boys and their youngest sister. In 1901 Ruth and the 2 boys moved to a new address in Bradford, and the three formed the Jowett Motor Manufacturing Company that year so that the two boys could escape from having to work for their increasingly cantankerous father. Ruth's share was later bought out. Both brothers were born and died in Bradford: William was born in 1877 and died in 1965, while Benjamin was born in 1880 and died in 1963. Production of cars began in 1910, and about 48 were built by 1916 when their little workshop switched to war work. Two of these early Jowetts survive to this day. Car manufacture recommenced in 1921 in a new factory at Idle, where the tramway ended. The factory was built on filled-in quarries - as production expanded more quarries were filled in. Even today there are some worked-out quarries near the old factory site, which today is an enormous supermarket. Walter Jowett, a cousin, worked for Bill and Ben during WWI and was in 1920 installed as managing director of the sales company (still called the Jowett Motor Manufacturing Company) at the Grosvenor Road premises (cars were now being built by Jowett Cars Ltd at the Springfield Road factory at the village of Idle). Walter became the sole owner of JMMC in c.1945, when its name was changed to the Grosvenor Garage. It continued to sell Jowetts until there were no more Jowetts to sell. Walter had a son called Victor. William had a son called Clarence who had a son called Ian. Clarence worked at Jowett after qualifying as mechanical engineer in 1934 and was soon on the Board. Clarence was also involved in Bristol Tractors, a small company bought by his father in c.1936. This outfit made Jowett-powered "tractors" which were what we might call large cultivators; the numbers built were small. 18 in 1937, 21 in 1939, but 77 in 1940. In 1945 or 1946 Clarence severed his ties with Jowett Cars Ltd and concentrated on Bristol Tractors, now no longer Jowett powered. Apparently it was another William Jowett, Walter's brother, who emigrated to Canada, to found a cloth mill in Welland, Ontario, Canada. A son, Hebert, took it over, and employed many members of the Jowett family including a grandson James, who made bluejean type material. This mill may still be operating today. Alice Jowett McGarry writes: "Enjoyed your page. William and Benjamin were my great-grandfather's cousins. My grandfather was Herbert and he did work in the Welland Cotton Mill (bought out by Wabaso). He died in 1956. My father, James also worked in the mill occasionally and moved to Buffalo, New York, working as an electrical engineer. His brother, Herbert, worked in the mill from WW II until retirement and lives in Welland (Dain City) now. My brother, Richard Jowett, owns a Jupiter". 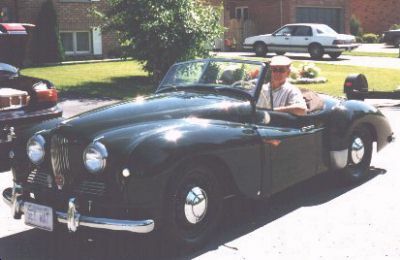 A number of Jowetts descended from Herbert live today in Canada and USA, and some four of those own Jowett Jupiters! The Jowett factory was sited at the village of Idle, within the city of Bradford in West Yorkshire, England. Bradford's website is well worth a visit. 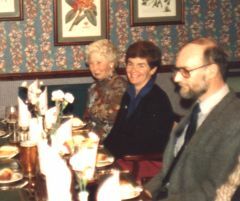 William Jowett's daughter was called Elsie, seen here (far left) at the dinner following the launch of the book Jowett - The Complete History in 1991. Her married name is Koch-Osborne. Her son Michael together with Ian Priestley researched the pre-WWII sections of the book. Also in the photo is Edmund Nankivell (far right). The book is available from Mike Smailes: fax +44 (0)1642-361 523. Some bearers of the Jowett name are Jupiter owners - most in the New World. Richard Jowett has owned te very good Jupiter 813 since 1997: Richard writes "My sister Alice, like myself, are related to the car company's founders in this way - our great grandfather's two cousins were William and Benjamin Jowett". Raymond Jowett has owned Jupiter 984 since 2011 and a certain Mr Jowett became the owner of Jupiter 133 in 2005. The two Jupiters owned by Ted and Richard are running: Bernard is restoring his. Here is Ted at the wheel demonstrating the turn indicator system in a shot taken in July 1997. Return to Jowett Jupiter Home Page contents. These are our links to the outside world are. But gluttons for yet more chit-chat about Jupiters might wish to jump to the Magazine overflow page. Did you know that British sports cars defy the laws of physics? You didn't??? The UK Motor Sport Index is committed to being the definitive unified information source for motor sport of all forms (whatever the governing body) taking place in the United Kingdom. This includes sport for historics. Demon Jupiter rally and racing man Keith Clements has opened a website dedicated to Jowett cars. East Anglian Section of the Jowett Car Club (UK) has its own website. This is a MOST EXCELLENT link. It is called britishcar.com and it has a huge amount of interesting material. Definitely worth a visit! The Jowett factory was sited at the village of Idle, within the city of Bradford in West Yorkshire, England. Bradford is "vibrant - diverse - full of surprises". Have a look - Bradford is a City of Culture and of cultural surprises too. Another Bradford website covers many other issues some connected with local government of the city, some not. Try it! And while you are at it what do you know about the Bronte Country? Here is an online www.classicmotorauction.com Classic Car auction website. Your car can be auctioned with Classic Car Auctions whilst being secure in your possession. The need to travel miles to view a car that is often not as expected is eliminated; the company ensures that the vehicles offered are as described and have safeguards in the unlikely event that the vehicle is not as expected. Well, there WAS a Jowett.com website, in fact there is again such a website. But there wasn't much on it last time I looked. It was devoted to an American clothing mill of the name Jowett Garment Factory based in El Monte, California.